Time doesn’t dim the memory of his passing. 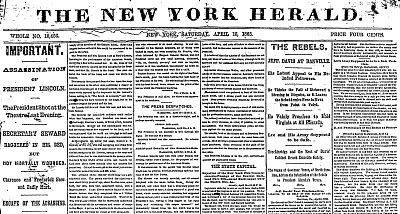 The New York Herald ran a special issue on the assassination of President Lincoln. Click Here to Read the entire newspaper: NY Herald 15 April 1865. GenealogyBank is packed with newspapers – 4,300 of them from 1690 to today. Use it to find your ancestors and to read the news as they lived it. Search it again – and see what you’ll discover about your ancestors.